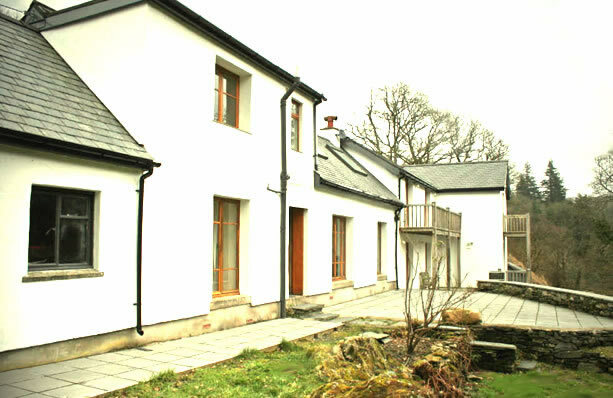 Accommodation - Cae Du is a non-smoking house. More information is available by selecting the links above. There is free WiFi for you to use and we are more than happy to allow up to 2 dogs on the premisis. The rear door is appx 800mm wide with a step up over the threshold appx 80mm. There is parking for several cars on an even slate/gravel surface, between 3 and 20 meters from the front door. The house and its 14 acres are set in sloping mainly wild grounds with some steep slopes in places the paths are mainly uneven grass. There is a lay by on the main road outside the front gate where the local bus will stop on request appx 40meters up hill from the front door. From the bedroom to the G/F bathroom would involve going through 5 door ways appx 740mm wide down 2 steps appx 120mm each in height and up 2 steps of similar height. There are 2 flights of stairs to the upstairs bedrooms one 750mm wide with 11mm treads the other 800mm wide with 12 treads. There are 2 steps into one of the upstairs bathrooms. The access from the ground floor is similar. Double wall oven, 6 hobs, microwave oven work top height, fridge, dishwasher, kettle, toaster, slow cooker, bread maker and coffee maker in the main kitchen with a breakfast bar and stools. There is a freezer and washing machine in the adjacent utility room where you will also find the ironing board, iron, vacuum cleaner and mop etc. The main lounge has 4 couches and coffee table with a TV, DVD and video recorders and a stereo system for CD's. The secondary lounge is smaller and aimed at those who would like a quiet read or to play games a supply of which we have left for your enjoyment. There are duvets in all the six bedrooms and fleece blankets located in wardrobes, (even a few hot water bottles). All bedding is supplied. Tesco and ASDA super market will deliver and goods can be ordered on line in advance of your trip. Betwys Y Coed some 5miles away has many tourist shops, small supermarkets, post office, bank and restaurants. Mobile phone reception is poor but at most times possible from the river side of the house. There is a land line but will only accept incoming calls. There is a selection of useful pamphlets on tourist attractions, transport timetables and local news on the bookshelves in the lobby.